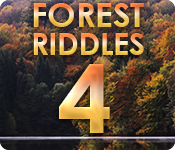 Forest Riddles 4 is rated 3.6 out of 5 by 9. Rated 5 out of 5 by Eveoflove from Finally: a long-awaited option Review based on 50 minutes of the trial period. Perhaps I'm biased as I own the previous 3 installments. I agree with another reviewer that said the colours are better; I still wish we had a few options to choose the tile pattern. One feature I LOVE is the fact that you can toggle between seeing all the layers or only the layer you're working on: this eliminates confusion between colors that are similar because you can work on 1 color without seeing the resolved tiles of other colors (any unveiled tile of another color shows "blocked" instead of its color). FANTASTIC. This will be another buy for me! Rated 5 out of 5 by arnold1049 from GREAT SERIES CONTINUES I completed the hour demo and found this game as good or better than the previous 3 games in this series. I played only the colored scenes, so I cannot offer an opinion on the monochrome scenes. The scenes start out fairly simple but quickly increase in complexity, making the game more challenging. There are several options available that can be combined in many variations, making the game good for beginners all the way to expert players. The colors are more vibrant with greater contrast that solves the issue with previous games where it was hard to fill the squares without making mistakes because the colors were so similar. This is a definite buy for me. Rated 4 out of 5 by catalano from It's about Time! It has been too long since there has been a puzzle game offered, so I was so excited. It's a good quality game, but a bit too easy. 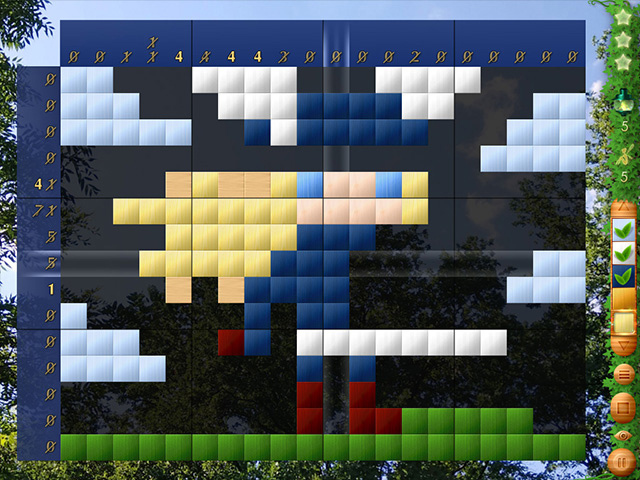 The flash around the squares is a bit distracting, but fun to play. Rated 3 out of 5 by rvearl from Horrible Sound Track As a mosaic gridder, this game is not bad. Nice colors, moderately challenging. But the sound track is awful. It is two songs--yeah TWO songs--over and over and over. This is a good game to play with the sound off while you listen to the Rachael Maddow Show. Rated 3 out of 5 by LanaPook from Too easy I was excited to see a new Forest Riddles game. I think I have bought all of the games in the series… except for this one. After playing the demo I decided not to buy it. It seems they have dropped the challenge level and …. if it's too easy it's just not fun for me. Perhaps I will get it with a BOGO offer on another game. Rated 3 out of 5 by verimeri from good but needs improvement I liked the first forest riddles a lot so am playing this version in monochrome. My issue is there are far too many levels where you have no hope of solving it without a hint. However you are penalized a star if you use a hint. Would be a great game if the puzzles were solvable by logic. And you should not get penalized for using a hint. Rated 3 out of 5 by Feckles from How Unfortunate I was so excited to see this new release from Forest Riddles. 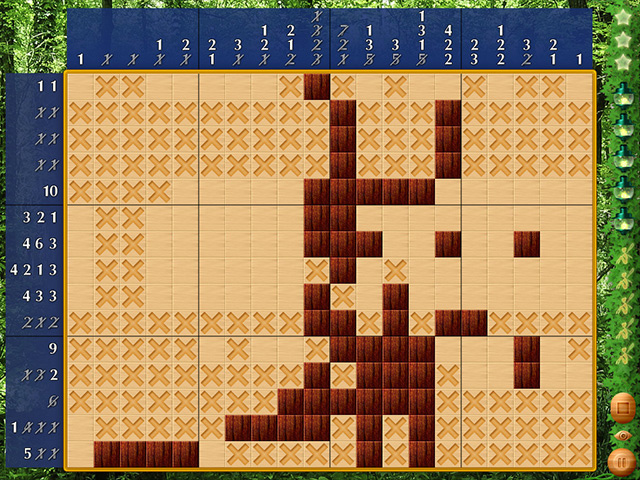 This developer provided some much needed challenge to these types of puzzles. They used colors very similar to each other so that when the picture was complete, it looked like a shaded painting instead of a cartoon drawing. What a nice change. The puzzles took time and a lot of thought. SO FUN! Not every gamer wants the games to be so easy, it takes 60 seconds to finish the puzzle. But, they listened to the complaints about the difficulty, and churned out another sleepy nonagram game. What a shame! Rated 3 out of 5 by Nancharra from Too tedious to enjoy. I love griddlers / mosaic games and since there has only been one since Christmas ( Fantasy Mosaics 33) i was really hoping for a new one, but was disappointed in this. The developers of Forest Riddlers have not taken on board what has been the critical comments from the previous ones. The Wallpaper is too strong, the darker colours merge, and together with black spaces it is difficult to enjoy being very tedious and so easy to make mistakes. 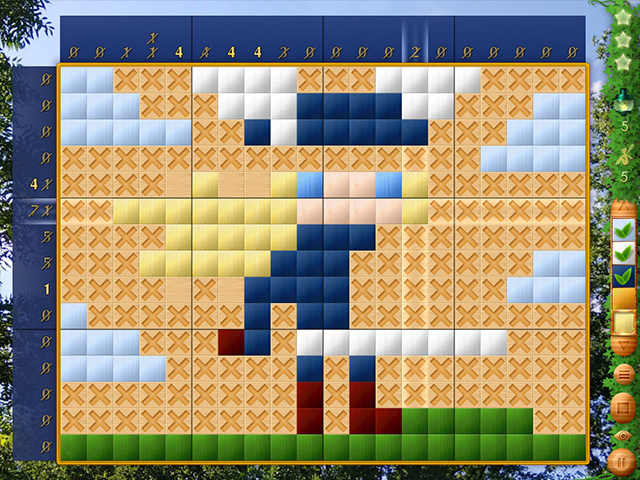 I like my puzzles to be challenging, but must be able to see the grid and the tiles clearly.